Speaking of permanent makeup training courses, it must be said that in this job specialisation is critical to stand out. The study of new techniques and the improvement of old methods, is essential to survive in a market where competition is fierce. Investing in professional training is increasingly becoming a need on and a duty for every professional, so I wanted to include a page in this web site dedicated to permanent makeup training courses! As in many other professional fields, there are two types of permanent makeup courses you can choose (with fee) to become a dermopigmentation specialist, a tattoo artist or, indeed, a permanent makeup artist: permanent makeup training courses that really teach you how to apply your first tattoos or to perform your first permanent makeup treatments on real models, and more theoretical courses which give you that certificate you need to do your job, namely regional qualifying courses [read my article: “Abilitazione Regionale: un po’ di chiarezza”] discussed above. One thing is for sure, if you want to become a true professional, you should attend both courses! This solution, in terms of cost/days, is certainly the most affordable! However, you should share your educational program with a group. Also, you can not choose days and hours, since everything will be decided in advance and you will need to buy or rent your own equipment. 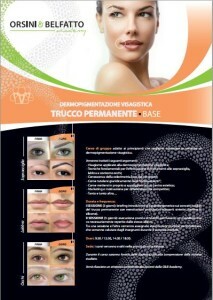 Orsini&Belfatto offers many Permanent Makeup group courses and advanced training courses, in different cities of Italy. These courses will give you the opportunity to work directly with Ennio ORSINI, in a qualifying customised path adaptable to your needs and requirements. Although they may seem more expensive, in terms of cost/days, in fact, being individual courses, they give you the information you need more accurately and efficiently, thus faster. Example: a permanent make-up group course of six days, can be easily replaced by an individual 2-3 day course! The precise number of days is very subjective and depends on the learning ability of the student. A person who starts from scratch needs at least 2 days of study, sometimes 3. A person who already know the basics of tattooing needs a maximum of 2 days. It is better if these study days are scheduled at a distance of 1 or 2 weeks. Finally, for refresher or specialisation courses, designed for operator who already practice permanent makeup, one day may be sufficient. If you want to learn more, or if you want to schedule an appointment and you do not know where to start, please read our FAQ page or call our dedicated staff on +39 0864568436 – info@ennioorsini.com.